Effortless directional changes on the fly: Compact engine design and overall dimensions allow for excellent mass centralization and enhanced balance to help make it even easier for a rider to change direction, on the ground or in the air. Plus the lower profile design enables easy forward movement. Even more power: New smooth and efficient DOHC engine is designed for more top-end power and improved acceleration, featuring increased cam lift, larger titanium valves, plus updates to the piston shape for an engine that’s more powerful than ever. Programmed for power: The Programmed Fuel Injection (PGM-FI) system mapping is designed to take full advantage of all upgraded engine components and features shorter ratios for both first and second gear. Engine Mode Select button: The CRF250R’s engine stop switch and Engine Mode Select Button (EMSB) are now incorporated into an intuitive handlebar housing with small light indicator to select between three engine mode maps: standard (mode 1), smooth (mode 2) and aggressive (mode 3)—perfect for dialing in the best power curve for better starts, better drive out of corners, better traction, or simply to better suit your riding style. Modes two and three can even be fine-tuned using the optional HRC setting tool. Mode selection is easily accomplished without changing the rider's hand position or shutting down the engine (as long as the engine is idling). Improved tuning: Tuned for dynamic riding performance, the intake and exhaust are expertly engineered to work in conjunction with a new 13.9:1 compression ratio, increased bore and reduced stroke for optimal power and balance. 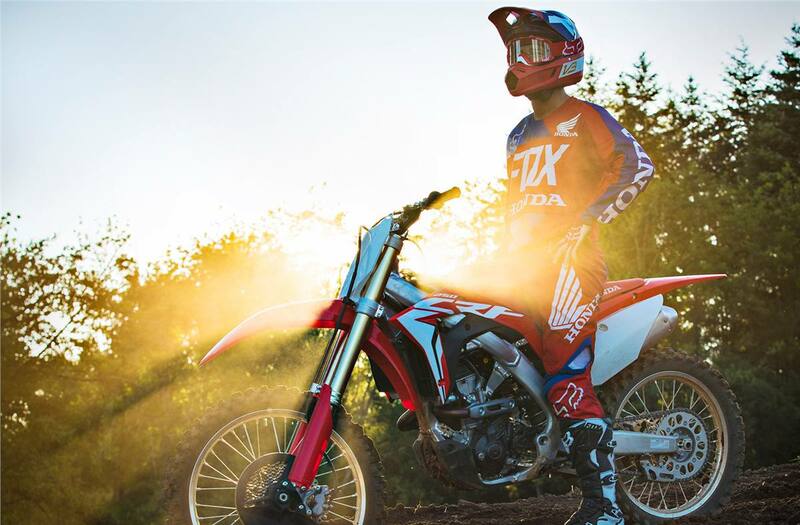 Keeping cool: The new front mudguard design efficiently directs more air to the large radiators to handle the output from the more powerful DOHC engine and further enhance the CRF250R’s renowned reliability. Easy electric start: New standard electric start replaces the kickstarter to get you going quickly and effortlessly with the simple push of a handlebar mounted button. 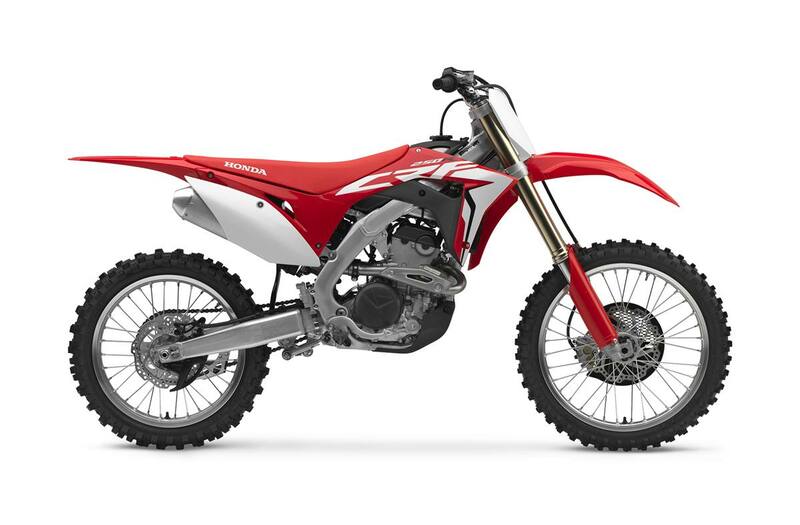 Excellent feel & feedback: Sharing the same mass-centralized chassis and new 6.3 L titainium fuel tank as the race ready CRF450R results in a lower centre of gravity, while the 7th generation aluminum frame and new aluminum rear subframe combine for improved lightweight performance and an increased 327 mm of ground clearance. Precise handling: The Honda Progressive Steering Damper allows more-aggressive chassis geometry for quicker steering, while also assisting straight-line handling. Damping action smoothly progresses as handlebar deflection increases, which produces very natural steering characteristics and feel. Improved Showa fork: The new 49 mm fully adjustable Showa coil-spring front fork air fork on the CRF250R includes a number of clever innovations resulting in reduced weight, improved balance, superior suspension action and simplified adjustability. Full adjustment: Pro-link® rear Showa suspension offers full damping adjustability and over 12 inches of smooth, well-controlled travel. Stop hard: The full 260 mm two piston front brake and 240 mm rear one piston brake feature an advanced wave-pattern rotor design, offering excellent stopping power plus superior lever feel. Better grip: The Dunlop MX3S Geomax tires offer excellent traction in a wide variety of conditions with 21 inch front and 19 inch rear aluminum wheels. 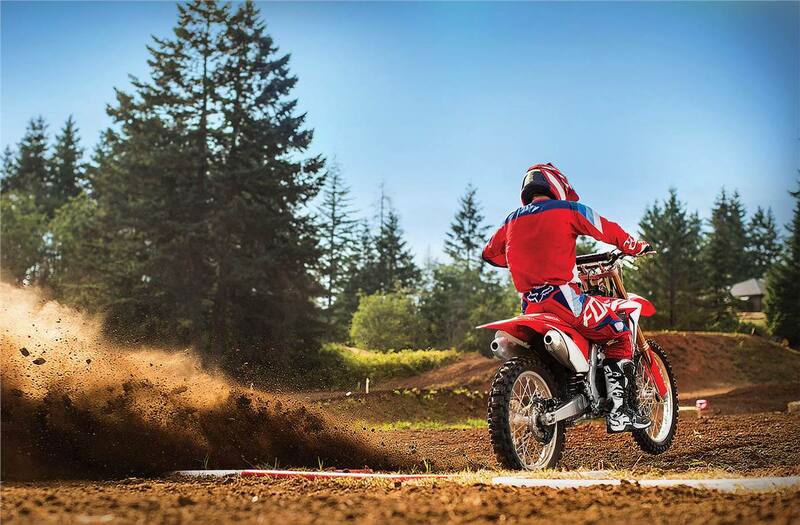 Move freely: Optimized rider ergonomics with a very narrow midsection allow you to move freely on the bike and fully utilize the CRF’s incredible agility. 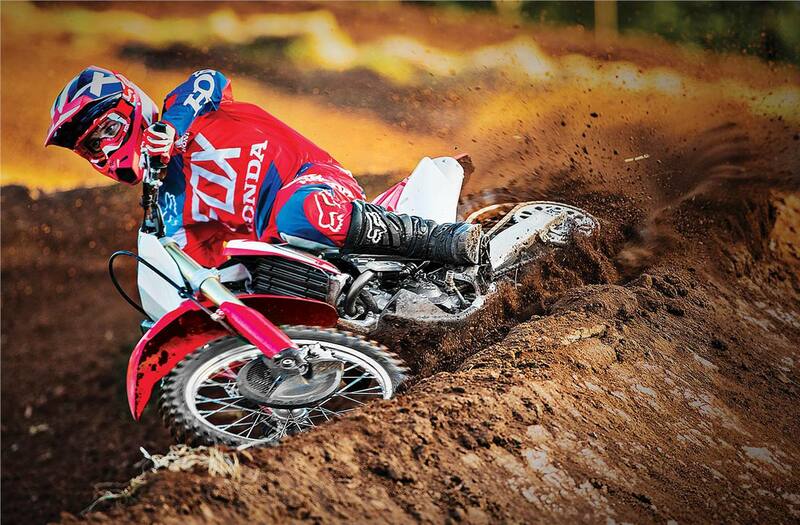 Comfort paired with control: Wide, long footpegs offer greater support for more comfort and control. Simplified maintenance: The design of the fuel hose connector simplifies maintenance. Connectivity simplifies setup: Optional HRC setting kit includes an easy-to-use programming system with precise data for setting up the machine to meet all race situations. Ignition timing and fuel mapping settings can be uploaded by connecting the motorcycle to a computer and following simple step-by-step instructions. The system radically simplifies the setup process and makes tuning accessible to a wide spectrum of riders. Connection is simple with only one connector and no need to remove the fuel tank.